This fine mixed media work is a study for the 1971 acrylic painting The River Spree in the collection of the Museum moderner Kunst in Vienna, produced during Alex Colville's 1971 stay in Berlin. 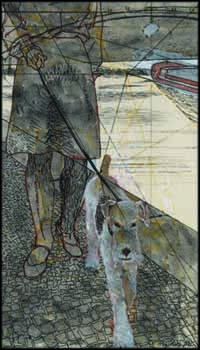 The artist’s works often depicted the relationship between animals and people, and in this image Colville's wife Rhoda walks their terrier Shasta along the river's edge. The River Spree cut through what was then East and West Berlin, and the Berlin Wall, still in place in 1971, ran along its bank. Colville’s work often contains undercurrents of potent meaning. In reference to the acrylic The River Spree, Mark Cheetham writes that "Colville, who we know, dislikes apolitical people, trusts that we will catch the drift of the painting, the sense that apparent calm and quotidian activity may mask a volatile political situation." Colville saw animals as inherently pure and good, and in this close-up study of woman and dog, Shasta embodies an innocence that contrasts the charged situation in Berlin at the time.